I have always loved long books, the sort you can bury yourself in for weeks, becoming immersed in a fully-formed fictional world and getting to know characters who, by the time you reach the final page, feel almost like personal friends. Kristin Lavransdatter, though, is more than just a ‘long’ book – it’s a very long book! With over 1,100 pages in the edition I read, it’s similar in length to classics like War and Peace, Don Quixote and Les Miserables and left me with a similar mixture of feelings on finishing: a sense of achievement at making it to the end; sadness at having to say goodbye to Kristin and her family; and, I have to admit, relief at finally being able to move on to something else. I enjoyed Kristin Lavransdatter – loved it at times – but it’s not always an easy book to read, for reasons which I’ll explain below. So far I have been describing this as a ‘book’, but in fact Sigrid Undset originally wrote three individual books about Kristin – The Wreath (first published in 1920), The Wife (1921) and The Cross (1922) – which have been combined into one volume in this Penguin Classics edition. It’s still possible to buy them separately (and it would probably seem less daunting that way) but they don’t stand alone very well at all and really do feel like three sections of a longer novel. After finishing the first part I moved straight on to the second and then the third and I was glad I took this approach otherwise I would probably have lost track of what was happening. Set in the 14th century, Kristin Lavransdatter is, unsurprisingly, the story of Kristin, daughter of Lavrans. We first meet Kristin as a young girl growing up on her parents’ manor at Jorundgaard in Sil, a rural area of Norway. A good, honourable, hard-working man, Lavrans gains respect and admiration wherever he goes and he and Kristin are very close. His wife, Ragnfrid, however, has never fully recovered from the loss of three young sons and as a result her relationships with both Lavrans and Kristin are strained. Early in the novel, Kristin is betrothed to the quiet, reliable Simon Darre, whose family own a neighbouring estate. She has no reason to dislike Simon, but she feels nothing for him and longs to experience the sort of passion her own parents’ marriage lacks. Her chance comes when she meets and falls in love with Erlend Nikulausson, a man who is handsome, charming and romantic – in other words, everything Simon isn’t. Kristin knows that this is the husband she has been dreaming of and even the knowledge that he has been excommunicated by the church for living with another man’s wife doesn’t change her mind. When Simon finds out about Erlend he agrees to break off the betrothal, but it takes a lot longer for Kristin to persuade Lavrans and Ragnfrid – so long that by the time she is eventually allowed to marry Erlend she is already pregnant with his child. In case you’re thinking I’ve given away too much of the plot, all of the above happens in The Wreath alone. The other two parts of the book – The Wife and The Cross – explore the consequences of Kristin’s decision to marry Erlend rather than Simon. And the consequences are varied and far-reaching, affecting not only Kristin herself but everyone else around her. It’s a sad and tragic story and this is one of the reasons why, as I mentioned earlier, this is not the easiest of books to read. Whether it’s a death, an illness or an accident, a murder, an act of betrayal or an unhappy marriage, each and every character is subjected to a relentless stream of misery. My heart ached for Kristin as she discovered that the man she had married was not all that she had hoped he would be – not a hero but a flawed human being – and that making their relationship work was going to be difficult. However, I also had some sympathy for Erlend; he is not a bad man but he is sometimes a weak one, with a tendency to act before he thinks and with none of the skills necessary to manage a farm and household effectively. He makes mistakes and has to live with those mistakes, but so does Kristin and I thought it was unfair of her to place so much of the blame on him. I also felt sorry for their young children, for Simon (who ended up being one of my favourite characters) and for Kristin’s sister, Ramborg. As I said, this is not a happy story for anyone! As we accompany Kristin on her journey through life, we are also given a lot of information on the history and politics of the period. This becomes increasingly important as Erlend finds himself embroiled in a plot against the king and, I have to admit, I found some of this difficult to follow. If I read the book again (as I’m sure I will want to at some point in the future) I’ll have to concentrate more on that aspect of the story. Of more interest to me was the portrayal of daily life in the valleys and mountains of medieval Norway, a way of life strongly influenced by the Catholic Church, but also steeped in superstition and folklore. 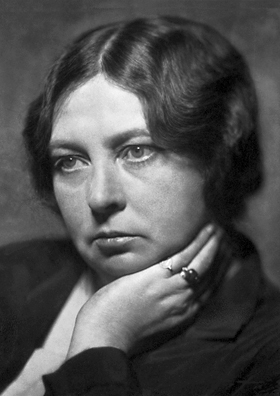 The publication of Kristin Lavransdatter led to Sigrid Undset being awarded the 1928 Nobel Prize in Literature “principally for her powerful descriptions of Northern life during the Middle Ages”. 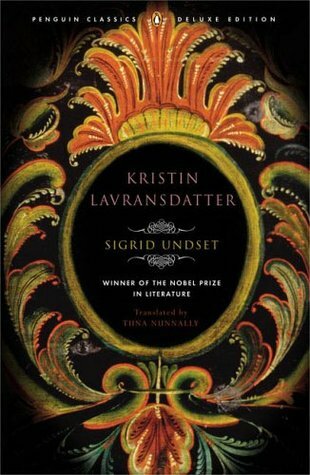 Finally, I should mention that Kristin Lavransdatter was originally written in Norwegian. The English translation I read was a recent one by Tiina Nunnally and I had no problems with it; I thought it was very clear and readable. I’ve heard that the earlier translation from the 1920s by Charles Archer and JS Scott is not as accessible, so I’m happy that I made the right choice. Kristin Lavransdatter was the book selected for me in the Classics Club Spin back in March – and it kept me busy until June! Now I’m looking forward to starting my next Spin book: Prince of Foxes by Samuel Shellabarger. Thanks! I’ve read that the old translation is very dated and difficult to read, but I didn’t have any problems at all with the Tiina Nunnally one so it could be worth you having another go. It was definitely worthwhile – and not so daunting once I actually got caught up in the story! I haven’t come across any of Tiina Nunnally’s other translations, but then, I don’t read a lot of Nordic crime. Congratulations on making it through! I loved what I read, quite a few years ago now, and regretted losing the threads, so you’ve definitely inspired me to pick my copy up again. I read Kristin last year & loved it. I agree that it’s best to read the three books straight through. I’m reading The Tale of Genji this winter (another long book) & I find that if I leave it for a few days, I lose track. I only put it down because the book is so heavy & my cats like to sleep on my lap in the evenings. The translation is so important, isn’t it? I dipped into an older translation but found it quite clunky after reading Nunnally. I’m glad you loved Kristin too, Lyn. I haven’t read The Tale of Genji yet, but I’m sure I’ll be tempted at some point. Maybe it will be my long book of 2017! I am so grateful for your review! I have long wanted to read this and now knowing the correct translation to read moves me even closer. This seems to be the year of long books for me and that is fine. I too love living in the same world and with the same characters for a good length of time. Excellent review. If you’re thinking about reading this book I would definitely go with the Tiina Nunnally translation. It’s a challenging read anyway due to the length and the setting, so a good translation is a big help! Having read Kristin Lavransdatter in both the original Norwegian and Tina Nunally’s translation I totally agree with you. I find mysekf struggling with the Norwegian version after living in the US for 50 years–it feels strangely unwieldy and awkward. This was my first Historical Fiction read as a young teen in 1950’s Norway.. I did not re-visit it until I found Nunally’s version after moving to the Seattle area in 1992. I really enjoyed your analysis and may dig out my English Language copy again. I’m pleased you agree with my comments on the translation, especially as you’ve also read the Norwegian version! I did wonder if I was missing very much by not being able to read the original. In reading some of the comments here, I see some references to Dorothy Finney’s King Hereafter and totally agree. My next venture into Historical Fiction after the Nunnally translation was King Hereafter, and it remains my all time favorite in the genre. I loved King Hereafter, although the Lymond Chronicles are my favourites of Dunnett’s novels. I’m so glad you enjoyed this, Helen. I can completely sympathise with your sense of achievement on finishing it. It really does feel like scaling a mountain and suddenly seeing the beautiful view from the top, doesn’t it? Yes, Nunnally’s translation is very good. I doubt I’d have stuck with the older translation. Thank you for your very thorough thoughts; good to revisit the book through someone else’s eyes. And you have Prince of Foxes up next! Gosh, lucky you. I’d love to read that again for the ‘first time’. I’m pretty sure you’ll enjoy that, if your fondness for Sabatini is anything to go by… Have fun with it! Scaling a mountain is exactly how I would describe the experience of reading this book – and yes, the view from the top made it all worthwhile! I seem to remember that you loved Prince of Foxes. I have high hopes for that one! I enjoyed this. I read the same edition, and I also remember the feeling of accomplishment when I finished it! I picked up one of the single-volume books at some point, and the introduction had some major spoilers, which made me a little reluctant to read the last part. I enjoyed The Wreath the most, of the three. I think she did a marvelous job of evoking Kristin’s world, in the everyday details and also in how people saw their world. Of course I couldn’t help thinking of Dorothy Dunnett – both because of King Hereafter and because she is the standard against which I judge historical fiction. Yes, I remember that you enjoyed this book too, though I’m sorry to hear you came across spoilers – I’m glad I managed to avoid them! I also thought of Dorothy Dunnett while I was reading this book; it does have a similar feel to King Hereafter. It feels like I should almost be congratulating you on reading such a long book 😀 I love the idea of a book set in medieval Norway, with all its superstition and folklore, but I don’t think I could handle ‘a relentless stream of misery’! I hope you enjoy your next Spin book, Prince of Foxes by Samuel Shellabarger, too – it is not one I’ve heard of before. My result for the last Spin was Journey to the Center of the Earth by Jules Verne and I am a good way into it now. Feels like quite an accomplishment to get it read, though, doesn’t it? I read it many years ago, I think in the three parts. It is certainly a somber tale. I read this (as three books) a long, long time ago and loved it, though the details are hazy to me now. I think it would be worth a re-read, particularly since I still have the books on my shelf. I’m sure a re-read of this book would be very rewarding. I would like to read it again myself one day so I can pick up on all the little details I know I missed the first time!